BugE - More than a bike, less than a car: The LiFeMnPO4 pack and BMS arrives. What next? Note: This BMS system is no longer sold by Elite Power but it may still be available from other companies. The batteries, charger and BMS came in two boxes. One was for the charger (large white box) and the other box had everything else in it. The batteries have removable purple covers. There is extra room in them. So, it's likely the tiny BMS boards can be installed under the covers to make the wiring look nice. Each set of four cells came pre-connected with metal bands on them (as shown in yellow box). Measuring the 4-pack gave a voltage of 13.1V . Also with the BMS kit is a small LED bar graph display (middle black thing). Also, the vendor provided a free LCD display as well. The reason it's "free" is that it has a display defect. So it works, but looks ugly. Should I want to have a better looking one, I can purchase another one later. The BMS circuit boards came pre-wired, probably because I bought a "demo" system rather than a new one. On a new system, it's likely I would need to wire each board as I found it in the string. So, this is the "big picture" of how the battery management system should go together. Rick Suiter, my sales rep, emailed me instructions for a 24 cell model instead of a 16 cell model but I got the general idea. Like most things, these representative images are simpler than reality. S ince I need to make some decisions on mounting locations, I decided to lay out the components. The LED bar graph looks like it can be press-mounted into a rectangular space, perhaps somewhere on my polycarbonate dashboard. The "Control Unit" also has a mounting hole for a screw. However, the "hub" has no native way to mount it. So, I can mound it somewhere with double-back tape. Wire length may be the deciding factor on where things get mounted. There were also some pieces that puzzled me. I got an assortment of additional metal pieces that I take to be conducting strips that work with the circuit boards. I'm also thinking having these strips will allow me to change the battery arrangement to have a wider or thinner pack. For #4 wire you can fold the edges around the cable and crimp it with a die size one or two larger. I've done this with 4ga wire and it seems to work well. See the attached picture. Soldering is an option, but there seems to be issues in a vibration intensive environment where the solder joints can fatigue and micro crack. If you did want to solder I would crimp first then back flow solder in to the wire, that way you are not relying on the solderto hold the connection, it is just there for extra conductivity. The other mysteries had to do with recommended interlocks to prevent the pack from being damaged from too much discharge. Looking over my parts, I found I had a mysterious small heat-shrink covered component which was the reset switch. Since it was too small to be captured by my camera, I used Sketchup to doodle out an approximate image of what the component looks like. On each end are the letters "L" and "D". So, from the response below, the "D" was supposed to be an "O". The little black piece with L and O on it is the low voltage cut off switch. ... The L side connects to the LIN hub, the O side is your output signal. You must provide a 12 volt and ground signal to the output side per the diagram, the middle wire is your switched signal for low voltage. I attached a document for the alarm cut out, it is for another version of the hardware, but the circuit on the last page will work to amplify the signal to drive a small relay directly if it is useful to you. Our warranty requires that the low voltage cut off be connected such that it disables the vehicle if a low voltage cell occurs. Speaking of loads, in the diagram, there are two DC-DC converters. One small one seems to be for only powering the LIN hub with "control unit". This converter apparently remains on 24/7. The other is the high capacity 12V DC/DC converter for everything else. The larger converter appears to be able to talk to the LIN hub as well. If a lithium cell either exceeds it's temperature or falls below a safe voltage, the BMS should "disable the vehicle" automatically. To do this, Rick offered the following suggestion. 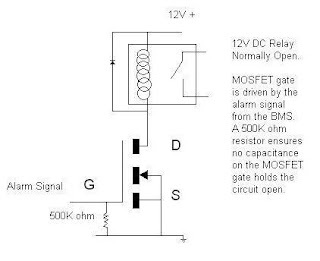 In most cases the alarm switch signal will be used to drive a relay which will either break an enable signal to the vehicle main controller or break the power to a main contactor coil. 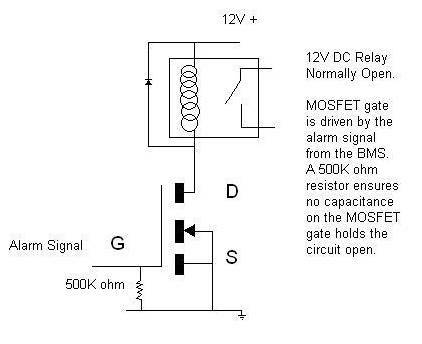 Since the 5 milliamp signal is typically insufficient to directly drive a relay the below circuit can be used to amplify the output signal enough to drive a relay coil. However, warranty or not, it's safety first. I don't have a problem with the traction motor loosing power if the pack reaches it's discharge state. However, if I'm gliding to the side of the road, my BugE needs hazard lights to warn the other drivers behind me that this BugE is goin' down! So, how can I provide power to lights while the main pack recovers? Well, I need to re-think the decision of having a single DC-DC converter versus having a small 12V battery, charged with a 12v DC/DC converter. With Optima batteries, I think having a converter with no separate battery is the best approach. It's proven to be simple and effective. However, with a fussy lithium pack, a supplemental 12V battery is needed. So, this will require some changes to the wire harness to add a battery, charger, charge regulator and interlock. Then, there will be the challenge of finding a place on the BugE to mount a small motorcycle or gel cell battery. As they say, nothing is simple. As for where to mount the other components, it looks like the LED bar graph could be mounted on the transparent dashboard where the existing 48V meter is. I could mount the larger LCD display on the dashboard as well. However, given the condition of my "free" display, it's likely I'll only use it for testing but not for everyday driving. So, I'll probably Velcro that display to the glove box area so it can be easily removed when not needed.